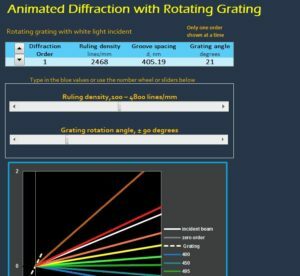 As an extended version of the Animated Diffraction Grating template, the Animated Diffraction with Rotating Grating template allows you to go one step further by giving you the ability to rotate your simulated diffraction device in addition to change the diffraction order and ruling density of your light beam. This is a great tool for physics students studying the age-old concept of optics. This will allow you to manipulate a light beam and see how various changes can influence the wavelengths that spring forth from the template. No expensive tools needed for a steady and reliable stream of light, the convenient sliders will let you set the parameters so you’re free to explore the wide-open ranges that optics has to offer. After downloading the template, you will see the main graph at the bottom of the page showing the light diffraction simulation and the options to change certain variables at the top. The point of diffraction/grating surface is displayed in the dotted gray line below. In this template, you can actually adjust the grating rotation angle. In the table to the side of your simulation, you will see the different wavelengths displayed in nanometers. When you see a wavelength displayed in blue, you will know it is around 400 nanometers. In the options above, you can change the angle of diffraction order (The higher the order, the greater the overlap into the next order). You can also choose the ruling density, which is simply the display of order for wavelengths with certain densities. For example, if you choose to set your ruling density at 4,000mm, you will likely only see lower wavelengths, such as blue and green. You can also change the groove density, which shows that the angle is dependent on the grooves’ period, and not the shape. Using the slider or entering your own figure into the cell, you can effectively concentrate the diffracted energy into a certain order for a specific wavelength. The last option on the template simply allows you to change the angle of your grating point (displayed as a dotted gray line). This template makes learning about optics and diffraction simple and approachable. Try this template for free!